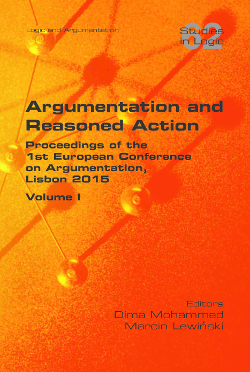 This is Volume I of the proceedings of the 1st European Conference on Argumentation: Argumentation and Reasoned Action, held at the Argumentation Lab in Lisbon, Portugal, in June 2015. The European Conference on Argumentation (ECA) is a new pan-European initiative aiming to consolidate and advance various streaks of research into argumentation and reasoning: philosophy, communication, linguistics, discourse analysis, computer science, psychology, cognitive studies, legal theory, etc. The proceedings comprise what we think is the most complete statement of the state of the art of argumentation studies today across these disciplines. From ancient rhetoric to Artificial Intelligence, and from analytic philosophy to detailed empirical research, the contributors examine argumentation theory and practice with a special focus on argumentation aimed at reasoned action. It's gratifying to have all this research collected in one source and realise the breadth and depth of the lively debates in argumentation studies.